Solution for injection Single use vial of 1 ml: Box of 1. Each vial contains: Filgrastim (r-Met-hu-G-CSF): 300 µg (30 MIU). Excipients: sorbitol, polysorbate 80, acetic acid, sodium hydroxide (pH = 4.0), water for injection. 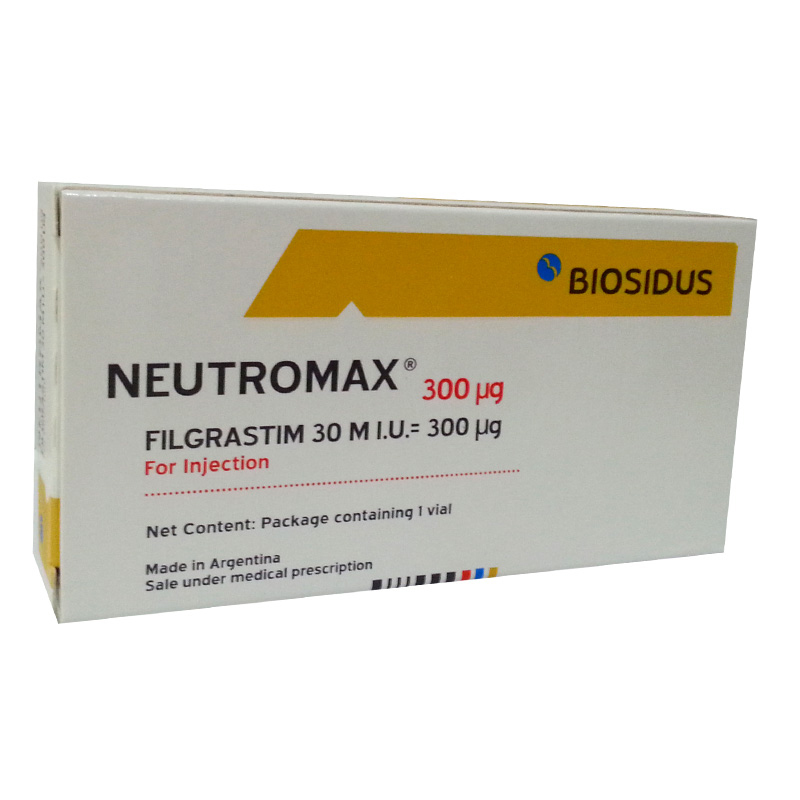 Filgrastim is a form of human granulocyte colony stimulating factor (G-CSF) obtained by recombinant DNA technology from a laboratory strain of genetically engineered Escherichia coli bacteria, with the insertion of the human gene coding for the human granulocyte colony stimulating factor. The amino acid sequence of the protein is identical to that expected from the DNA of the G-CSF gene, with the addition of the amino acid methionine in the N-terminal position, necessary for the expression in E. coli bacteria. Since filgrastim is produced in E. coli, the protein is nonglycosylated, thus differing from the natural protein. Endogenous colony stimulating factors act on hematopoietic progenitor cells stimulating their proliferation and differentiation, and some functional activities of the differentiated cells. Recombinant colony stimulating factors have the same biological activity as the endogenous ones. Filgrastim acts on progenitor cells capable of forming only one type of differentiated cells, the neutrophil granulocyte. The human granulocyte colony stimulating factor regulates the production and release of neutrophils from the bone marrow. Neutromax, containing filgrastim, significantly increases neutrophil count in peripheral blood within twenty 4 hrs of administration, with minor increases in monocytes. This effect on neutrophil count is dose dependent. Neutrophils produced by the human body in response to Neutromax show normal or even enhanced function, as demonstrated by tests of chemotactic and phagocytic function. Following discontinuation of Neutromax therapy, circulating neutrophil count decreases by 50% after 1 to 2 days, and returns to baseline levels within 1 to 7 days. Treatment with filgrastim significantly reduces the incidence, severity and duration of neutropenia and febrile neutropenia frequently observed in patients undergoing cytotoxic chemotherapy. Patients treated with filgrastim and cytotoxic chemotherapy require fewer and shorter hospitalization and decreased antibiotic use compared to patients treated with cytotoxic chemotherapy alone. The infusion of progenitor cells mobilized with Neutromax attains a quicker hematological reconstitution if compared to that of patients who underwent allogenic bone marrow transplantation. Administration of Neutromax to healthy donors permits obtention of progenitor cells in most of them. The use of Neutromax in patients with chronic neutropenia increases the neutrophil count and diminishes the infectious processes. In patients infected with the human immunodeficiency virus (HIV), administration of Neutromax improves the neutrophil count and therefore, can avoid the need for dose reduction of antiviral drugs. A positive linear correlation between the dose and the serum concentration of filgrastim occurred after either IV or SC administration. Filgrastim is detected in serum within 5 minutes following SC administration. After 4 hrs of administration, the number of neutrophils starts increasing till peak serum concentration, which occurs between 2 and 8 hrs following SC administration. The volume of distribution averages 150 ml/kg. Following either SC or IV administration, the clearance of filgrastim follows first-order kinetics. Elimination half-life of filgrastim both in healthy subjects and in cancer patients is of approximately 3.5 hrs with a clearance rate of approximately 0.6 ml/min/kg. Continuous infusion of filgrastim over a period of up to 28 days, in patients recovering from autologous bone-marrow transplantation, did not show evidence of drug accumulation or changes in the elimination half-life. Cancer patients receiving myelosuppressive chemotherapy: Neutromax is indicated to reduce the incidence of febrile neutropenia and infections in patients with myeloablative malignancies (other than chronic myeloid leukemia and myelodysplasia) under antineoplastic treatment with cytotoxic drugs, associated to a significant incidence of febrile neutropenia. Cancer patients receiving bone marrow transplantation: Neutromax is indicated to reduce the duration of neutropenia in patients under myeloablative chemotherapy followed by stem cells or bone marrow transplantation. Patients undergoing induction of mobilization of hematopoietic progenitor cells into peripheral blood followed by collection and autologous or allogenic infusion: Neutromax is indicated to induce mobilization of hematopoietic progenitor cells in these patients. Patients with severe chronic neutropenia (severe congenital neutropenia ISCN]), cyclic neutropenia or idiopatic neutropenia): Prolonged administration of Neutromax is indicated to reduce the incidence and duration of neutropenia sequelae (namely, fever, infections, oropharyngeal ulcers) in patients with severe congenital neutropenia (SCN), cyclic neutropenia or idiopathic neutropenia that are symptomatic (history of severe or recurrent infections). It is essential that a careful differentiation from other hematological conditions be made. Neutropenia associated to the acquired immunodeficiency syndrome (AIDS): Neutromax is indicated to treat AIDS patients with persistent neutropenia associated to opportunistic infections (such as cytomegalovirus) or to antiviral agents (zidovudine, ganciclovir). Treatment of drug-induced neutropenia: Neutromax is indicated to treat drug-Induced neutropenia. Neutromax is contraindicated in patients with known hypersensitivity to E. coli derived proteins, to filgrastim or to any other product component. Neutromax is also contraindicated in patients with severe congenital neutropenia (Kostmann's syndrome) with cytogenetic abnormalities. Allergic reactions: Allergic-type reactions have been reported on initial or subsequent treatment in less than 1 out of 4000 patients treated with filgrastim. These have been characterized by systemic symptoms which involve at least 2 body systems, most often skin (rash, urticaria, facial edema), respiratory (shortness of breath, dyspnea) and cardiovascular (hypotension, tachycardia). Some reactions appear upon initial exposure to the drug. Reactions tend to occur within 30 minutes after administration and more frequently in patients receiving filgrastim by IV route. Rapid resolution of symptoms occurs in most cases after administration of antihistamines, steroids, bronchodilators and/or epinephrine. Symptoms recurred in more than a half patients re-exposed to filgrastim. Splenic rupture: Rarely, splenic rupture following filgrastim administration has been reported both in healthy donors and in patients. Some of these cases were fatal. Individuals receiving Neutromax who report pain of the upper left quadrant of the abdomen and/or shoulder tip pain should be evaluated for enlarged spleen or splenic rupture. Adult respiratory distress syndrome (ARDS): Adult respiratory distress syndrome has been reported in neutropenic patients with sepsis under filgrastim treatment who developed fever, pulmonary infiltration or respiratory distress. Therefore, patients with such manifestation should be evaluated for the risk of ARDS. In the event ARDS occurs, Neutromax administration should be discontinued until ARDS resolution and the patient should receive the proper medical management to revert this clinical condition. Sickle cell disease: The use of Filgrastim has been associated to the occurrence of a severe outburst of falciform cells which in some cases has resulted in death of sickle cell disease patients. Only qualified or experienced physicians in the management of sickle cell disease should prescribe Neutromax to this patient population and only after a careful evaluation of the potential risks and benefits. Patients with Severe Chronic Neutropenia (SCN): Since the safety and efficiency of filgrastim in the management of neutropenia resulting from other haematopoietic disorders (for instance, myelodysplastic syndromes (MDS) have not been established yet, SCN diagnosis should be confirmed before initiating treatment with Neutromax. Cases of MDS and acute myeloid leukemia (AML) have been reported to occur in the natural history of congenital neutropenia with no cytokine therapy. Moreover, cytogenetic abnormalities and transformation into MDS and AML have been observed in SCN patients treated with filgrastim. Patients with severe congenital neutropenia and cytogenetic abnormalities should not receive Neutromax. Should SCN patients develop abnormal cytogenetics or myelodysplasia, the risks and benefits of continuing Neutromax therapy should be carefully evaluated. Other side effects: The British National Formulary (50th Edition, September 2005) includes other side effects associated to the administration of recombinant human granulocyte colony stimulating factor; transient hypotension, epistaxis, urinary abnormalities (including dysuria, proteinuria and hematuria), osteoporosis, exacerbation of rheumatoid arthritis, cutaneous vasculitis, thrombocytopenia, anemia, transient decrease in blood glucose, raised uric acid. Simultaneous use with chemotherapy and radiation therapy: The safety and efficacy of Neutromax given simultaneously with cytotoxic chemotherapy have not been established. Because of the potential sensitivity of rapidly dividing myeloid cells to cytotoxic chemotherapy, Neutromax should not be used in the span commencing 24 hrs before through 24 hrs after the administration of cytotoxic chemotherapy. The efficacy of Neutromax has not been evaluated in patients receiving chemotherapy associated with delayed myelosuppression or with Mitomycin C or with myelosuppressive doses of antimetabolites such as 5-fluorouracil. The safety and efficacy of Neutromax have not been evaluated in patients receiving concurrent radiation therapy. Simultaneous use of Neutromax with chemotherapy and radiation therapy should be avoided. Potential effect on malignant cells: Neutromax is a growth factor that stimulates mainly neutrophils and neutrophil precursor cells. The possibility of Neutromax acting as growth factor for some kind of tumor, however, should not be discarded. In a randomized placebo controlled trial to evaluate the effects of filgrastim in patients with AML under induction chemotherapy, no significant differences in the disease-free period or overall survival were observed. The safety of Neutromax in chronic myeloid leukaemia (CML) or myelodysplastic patients has not been established. When Neutromax is used to mobilize peripheral blood progenitor cells (PBPC), the bone marrow may release tumor cells that can be subsequently collected by leukapheresis. The effect of tumor cell reinfusion calls for further study since available data are inconclusive. Leukocytosis: Administration of filgrastim at doses above 0.3 MIU/kg/day (3 µg/kg/day) raise the leukocyte count up to100 x 109/L or above, in approximately 5% of patients though no adverse events associated to this fact have been reported. It is necessary to monitor, however, the leukocyte count periodically during Neutromax treatment for any adverse event associated to very high leukocyte counts. If after the nadir a leukocyte count above 50 x 109/L is observed, administration of Neutromax should be immediately suspended. Early discontinuation of Neutromax therapy: Cancer patients under myelosuppressive chemotherapy: Ordinarily, a transient increase in neutrophil count has been observed after 1 to 2 days after initiation of treatment with Neutromax. For a proper therapeutic response, however, treatment with Neutromax should be continued after chemotherapy till ANC reaches 10 x 109/L. Therefore, premature discontinuation of Neutromax is not recommended until count recovery after passing the neutrophil nadir. Immunogenicity: There is a theoretical chance that antibodies to filgrastim may cross react with endogenous granulocyte colony stimulating factor (immunologically mediated neutropenia). This event, however, has not been reported in clinical trials or during Neutromax commercialization. Risks associated to high dose chemotherapy: Special measures should be taken when chemotherapy is administered at high doses since improved tumor outcome has not been demonstrated and intensified doses of chemotherapeutic agents may lead to increased toxicities including cardiac, pulmonary, neurological and dermatological effects. Treatment with Neutromax does not preclude thrombocytopenia and anaemia due to myelosuppressive chemotherapy. Since treatment with Neutromax permit higher does of chemotherapy (e.g. full doses of the prescribed schedule), the patient may occasionally be at greater risk of thrombocytopenia and anaemia. Regular monitoring of platelet count and hematocrit is advised, especially when administering single or combination chemotherapeutic agents which are known to cause severe thrombocytopenia. Mobilization of peripheral progenitor cells: Patients who have undergone prolonged myelosuppressive chemotherapy schedules may show an insufficient mobilization, especially after use of Melphalan, BCNU or carboplatin. This effect has not been observed when Neutromax is simultaneously administered with these drugs. The effectiveness and safety in healthy donors aged under 16 yr or above 60 yr is unknown. Low platelet count (in the range of l00.000/mm3) was observed in 35% of healthy donors. No hematopoietic alterations have been observed in normal donors; however, the risk of clonal expansion in these individuals cannot be excluded. Once leukopheresis has been performed, donors should be monitored till blood count normalization. Isolated cases of splenic rupture have been observed in healthy donors after administration of colony stimulating factors. Therefore, it is recommended to monitor the spleen size by ecography and strongly consider diagnosis when pain is referred in the left hypochondrium. Other special precautions: Bone density assessment is indicated in patients with osteoporosis under continuous Neutromax therapy for over 6 months. No studies with Neutromax have been conducted in patients with renal failure or severe liver failure and consequently, the use of Nentromax is not recommended for this group of patients. Moreover, the effect of Nentromax in patients with a substantial reduction of myeloid progenitor cells is unknown. Neutromax mainly acts on the neutrophil precursor cells to exert its effect increasing neutrophil counts. Therefore, in patients with diminished precursors (such as those long treated with radiation therapy or chemotherapy), response to Neutromax may be reduced. Pediatric use: No adequate studies have been conducted to assess the relationship between age and use of granulocyte colony stimulating factor in children. Trials conducted on children did not show any difference in filgrastim pharmacokinetics when compared to results obtained in adults. Even though the use of filgrastim in pediatric patients has not been approved by regulatory bodies in the United States of America or Canada, there are limited data about its use in pediatric patients with severe chronic neutropenia. Filgrastim therapy over 18 months in patients aged 4 months to 17 years did not affect growth, development, sexual maturation or endocrine function. Filgrastim was well tolerated in pediatric patients with neutropenia secondary to chemotherapy. In the cancer setting, for a population of 12 pediatric patients, it has been reported that 1 patient on filgrastim showed palpable splenomegaly and another, musculoskeletal pain. Geriatric use: No specific studies have been conducted to assess the relationship between age and use of granulocyte colony stimulating factor in geriatric patients. However, clinical trials ordinarily recruit elderly subjects and no specific age-related problems that limit the use of Filgrastim in this age population have been reported. The safety and effectiveness of Neutromax when administered the same day of myelosuppressive cytotoxic chemotherapy are unknown. In view of the sensitivity of rapidly dividing myeloid cells to myelosuppressive cytotoxic chemotherapy, its use is not recommended in the period from 24 hrs before to 24 hrs after chemotherapy. Possible filgrastim interactions with other hematopoietic growth factors and cytokines have not been investigated in clinical trials yet. Caution should be taken when administering drugs that may enhance neutrophil release, such as lithium. Drug interactions between Neutromax and other drugs have not been thoroughly evaluated. Incompatibilities: Neutromax should not be diluted with saline solutions. Pregnancy: Considering that there are no well controlled, adequate studies in pregnant women, it is unknown whether Neutromax has effect on the developing fetus or on the mothers reproductive capacity. Scientific literature, however, describes passage of filgrastim to placenta when administered to pregnant rats in the last gestational stage and the apparent passage of filgrastim to placenta 30 hrs prior to delivery (<30 weeks of gestation) in pregnant women. Neutromax should be administered during pregnancy only if the therapeutic benefit justifies the potential risks to the fetus. Fertility: No effects on fertility were observed in male and female rats or during pregnancy at doses up to 500 µg/kg of body mass. Lactation: It is now known whether Neutromax is excreted in human milk, therefore, its use in nursing mothers is not recommended. There are relatively few side effects related solely to the administration of granulocyte colony stimulating factors. Most side events reported are due to occult tumors or cytotoxic therapy (fever, infection and mucositis) and decrease their frequency when granulocyte colony stimulating factor is administered. No development of antibodies to filgrastim or a reduced response have been detected over approximately 2 years of therapy on 500 patients. Administration of Neutromax at the recommended doses is frequently associated with musculoskeletal pain which is usually mild or moderate and generally reverts with standard analgesics. Its intensity is rarely severe. Other adverse events include arthralgia, musculoskeletal pain, slight to mild headache; rash or itching. Arthralgia and myalgia seem to occur when granulocyte count recovers. Pain generally occurs in lower limbs. Skeletal pain is generally slight to mild and can be treated with analgesics. This is reported in 20-50% of patients and is dose-dependent. Pain disappears after clearance of the granulocyte colony stimulating factor although it generally disappears even if treatment is continued. Skeletal pain is probably secondary to bone marrow expansion; this occurs in the 1 to 3-day period before myeloid recovery and increase of peripheral blood neutrophils. It originates in sites containing bone marrow, including sternum, spinal cord, pelvis and long bones. Skin rash, mostly, generalized and slight, has been reported. Another potential effect is reddening and pain in the site of SC injection. Less frequent side effect include urinary abnormalities (predominantly mild or moderate dysuria). Transient decrease in blood pressure, not requiring clinical treatment, have been reported occasionally. Reversible, dose-dependent and usually mild or moderate elevations of lactate dehydrogenase, alkaline phosphatase, serum uric acid, and gamma-glutamyl transpeptidase may occur with relative frequency. White blood cell counts of 100 x 109/l or greater have been observed in <5% of patients receiving Neutromax at doses above 0.3 MIU/kg/day (3 µg/kg/day), though no apparent complications were reported. Neutromax does not increase the incidence of clinical adverse events associated with cytotoxic chemotherapy. Frequency of adverse events reported in patients treated with filgrastim/chemotherapy and placebo/chemotherapy was similar and included nausea and vomiting, alopecia, diarrhea, fatigue, anorexia, mucositis, headache, cough, skin rash, chest pain, generalized weakness, sore throat, constipation and unspecified pain. Vascular disorders (e.g. veno-occlusive disease and fluid volume disturbances) have been reported rarely in patients under high dose chemotherapy followed by autologous bone marrow transplantation, although the causal association with filgrastim has not been established. Rare events include allergy and anaphylactic reaction; splenomegaly (generally asymptomatic), transient supraventricular arrhythmia (irregular and rapid heart beat); Sweet's syndrome, also known as acute febrile neutropenia, with fever and vasculitis. Enlarged spleen has been reported in patients receiving filgrastim to treat cyclic neutropenia. Subclinical splenomegaly occurs in approximately one third of patients and clinical splenomegaly in 3% of patients under chronic filgrastim therapy. Occurrence of Sweet's Syndrome coincides with the increase in neutrophil count. Cancer patients receiving myelosuppressive chemotherapy: The recommended dose of Neutromax is 0.5 MIU (5 µg)/kg BW once daily. The initial dose of Neutromax should not be administered within 24 hrs after cytotoxic chemotherapy. Neutromax should be administered by SC injection or IV infusion (30 minutes). Daily administration of Neutromax should continue till neutrophil count normalization after the expected neutrophil nadir has occurred. Treatment may be prolonged up to 14 days, depending on the type, dose and protocol of the cytotoxic chemotherapy used. Patients undergoing cytotoxic chemotherapy show a typical and transient increment of neutrophil count after 1-2 days upon beginning of filgrastim treatment. To maintain a therapeutic response, however, Neutromax treatment should not be suspended till neutrophil count is normalized after the expected neutrophil nadir. Early discontinuation of Neutromax treatment is not recommended before neutrophil nadir has been attained. If necessary, dose may be increased by 5 µg/kg BW for each chemotherapy cycle. Patients receiving autologous bone marrow transplant: The recommended initial dose of Neutromax is 1.0 MIU (10 µg)/kg/day, administered by IV infusion (different durations have been applied: about 30 minutes, 4 hrs or 24 hrs) or SC route (24 hrs), usually up to 21 days, starting 2-4 hrs after bone marrow infusion but not prior to 24 hrs after the last chemotherapy dose. The efficiency and safety of Neutromax administration for periods beyond 28 days in this group of patients is unknown. Once the neutrophil nadir has been overcome, when the ANC reaches 1.0 x 109/l, the daily dose of Neutromax may be reduced to 0.5 MIU (5 µg)/kg/day. After 3 additional consecutive days where ANC exceeds 1.0 x 109/l, Neutromax should be discontinued. Should the ANC decrease below 1.0 x 109/l, the dose may be maintained in 5 µg/kg/day. Should the ANC decrease below 1.0 x 109/l while the patient is receiving a dose of 5 µg/kg/day, the dose may be increased to 1.0 MIU (10µg)/kg/day. Collection of peripheral blood progenitor cells: For mobilization of peripheral blood progenitor cells for autologous infusion, the recommended dose of Neutromax when administered alone is 1.0 MIU (10 µg)/kg/day during 5-7 days by SC injection or 24-hr SC infusion. If administered after a myelosuppressive chemotherapy (to increase yield), administer 0.5 MIU (5 µg)/kg/day by SC injection starting once the chemotherapy is over and continue till normalization of neutrophil count. For mobilization of peripheral blood progenitor cells in normal donors for allogenic infusion, administer 1.0 MIU (10 µg)/kg/day during 4-5 days by SC injection. Severe Chronic Congenital Neutropenia: The recommended initial dose of Neutromax is 1.2 MIU (12 µg)/kg/day in a single dose or in separated doses by SC route. Adjust according to response. Severe Chronic Cyclic or Idiopathic Neutropenia: The recommended dose of Neutromax is 0.4 MIU (1 µg)/kg/day, and dose may be increased, if necessary, till ANC reaches normal values (usually until a maximum value of 0.4 MIU/kg daily). Thereafter, adjust till ANC can be maintained within normal values. Instructions for dilution: If required, Neutromax may be diluted in a 5% glucose solution. Once diluted, Neutromax may adsorb to glass and plastic materials. However, when diluted properly, Neutromax preparation is compatible with glass and a variety of plastics including PVC, polyolefin (a co-polymer of polypropylene and polyethylene) and polypropylene. If Neutromax is diluted to a concentration <1.5 MIU (15 µg) per ml, human serum albumin (HSA) should be added to a final concentration of 2 mg/ml. Example: in a final injection volume of 20 ml, for total doses of Neutromax of < 30 MIU (300 µg) 0.2 ml of 20% human albumin solution should be added. Dilution to a final concentration <0.2 MIU. (2 µg) per ml is not recommended at any time. Neutromax should never be diluted with saline since the product may precipitate. In cancer patients under Neutromax therapy as adjunct to myelosuppressive chemotherapy, the potential risk of excessive leukocytosis should be avoided. Neutromax administration should be suspended if the ANC surpasses 10 x 109/L after the chemotherapy-induced neutrophil nadir. The use of filgrastim beyond l0x 109/l may not result in any additional clinical benefit. The maximum tolerated dose of Neutromax has not been determined. Acute and chronic: Chills, dyspnea; excessive leukocytosis -generally asymptomatic; fever, headache, malaise; nausea, rash, tachycardia. Treatment of overdosing: In general terms, discontinuation of therapy with filgrastim is accompanied by a decrease of 5% in circulating neutrophil counts within 1 or 2 days, and normalization in a 1-7 days term. Respiratory function studies and leukocyte counts should be performed. Those patients confirmed or suspect of intentional overdose should be submitted to a psychiatric evaluation. In case of overdose, attend to the nearest hospital or phone toxicology centers. Neutromax should be stored in refrigerator between + 2°C and + 8°C. Neutromax remains stable during a short period (up to 7 days) at high temperature (up to 37°C). Diluted Neutromax should not be prepared more than 24 hrs before administration and should be stored in refrigerator between 2-8°C.